On the last show of August we welcome back Hardyman from BeerQwest and we discuss the question “if your went to a drive bar and no craft beer is there, what is the non craft beer that you would get?”. The beers we blind reviewed this week were Bootleggers Brewery Dr. Tongue and Green Flash Brewing Co. Double Stout Black Ale. 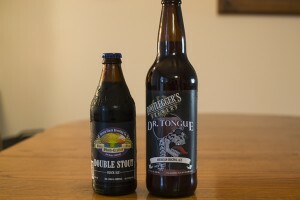 Posted in Blind Taste Testing (2011 - 2013) and tagged beerqwest, beers, Bootlegger's Brewing Co, bootleggers, brewing co, craft beer, Double Stout Black Ale, Dr. Tongue, Drive Bar, Green Flash, green flash brewing co, Non Craft beer, tongue.